(Phys.org)—A team of researchers with the University of Edinburgh has found what they describe as evidence of a comet striking the Earth at approximately the same time as the onset of the Younger Dryas in carvings on an ancient stone pillar in southern Turkey. The group has published their findings in the journal Mediterranean Archaeology and Archaeometry. Prior evidence based on ice cores taken from Greenland has suggested that a strike by a comet may have led to the onset of the Younger Dryas—a period of Earth cooling that lasted for approximately 1000 years. Other evidence also suggests that the cooling period caused groups of people to band together to cultivate crops, leading to the development of agriculture, which in turn led to huge leaps in technological innovations and societal developments, i.e. Neolithic civilization. 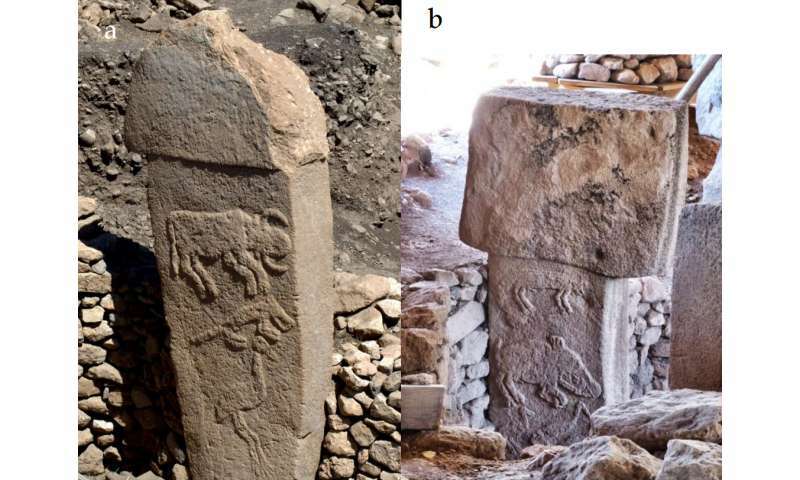 In this new effort, the researchers describe evidence they found on a stone pillar at Gobekli Tepe (the oldest known temple site) that aligns with the ice core findings—that a comet struck the Earth in approximately 10,950BC. The pillar was created by the people of Gobekli Tepe and now appears to have served as a means of commemorating a devastating event—perhaps a comet breaking up and its remnants crashing into the Earth, causing an immediate environmental impact around the globe and possible loss of life (one of the characters on the pillar was of a headless human.) The team fed likenesses of the images carved onto the pillar (known as the vulture stone) into a computer to determine if they might be linked with constellations. Doing so revealed associations between characters on the pillar and astronomical symbols in the sky for the year 10,950 BC. The fact that the people took the time and considerable effort to create the characters on the pillar suggests something very important must have happened during the same time period that the Greenland ice core suggests a comet struck, approximately 10,890BC. Wall pillars with three animal symbols in series. Part a) is pillar 2 from Enclosure A, while part b) is pillar 38, Enclosure D (images courtesy of Travel The Unknown). The researchers have concluded that the carvings on the pillar were likely meant to document the cataclysmic event and suggest that the temple may have been an observatory. 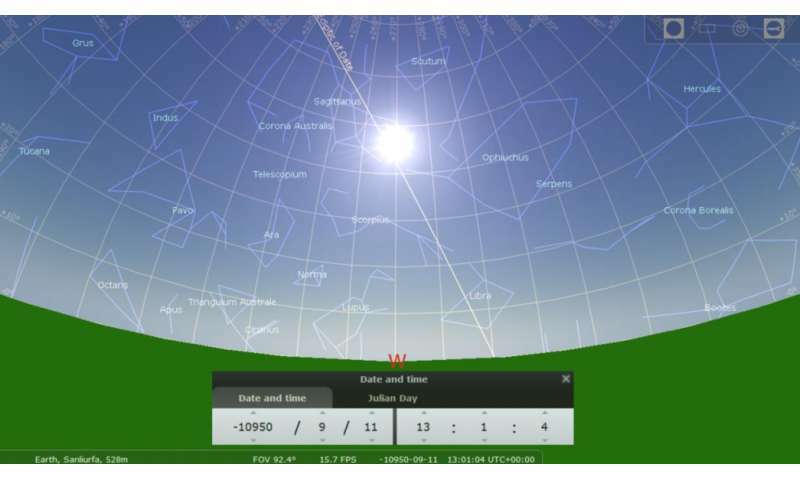 They also report that they found evidence of changes to the Earth's rotational axis as a result of the comet strike. We have interpreted much of the symbolism of Göbekli Tepe in terms of astronomical events. By matching low-relief carvings on some of the pillars at Göbekli Tepe to star asterisms we find compelling evidence that the famous 'Vulture Stone' is a date stamp for 10950 BC ± 250 yrs, which corresponds closely to the proposed Younger Dryas event, estimated at 10890 BC. 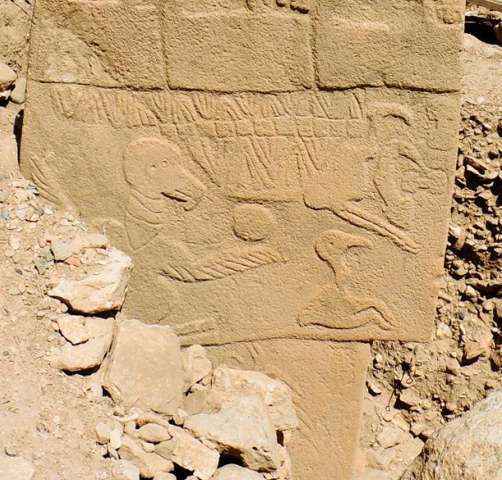 We also find evidence that a key function of Göbekli Tepe was to observe meteor showers and record cometary encounters. Indeed, the people of Göbekli Tepe appear to have had a special interest in the Taurid meteor stream, the same meteor stream that is proposed as responsible for the Younger-Dryas event. Is Göbekli Tepe the 'smoking gun' for the Younger-Dryas cometary encounter, and hence for coherent catastrophism? Gobekli Tepe has been dated so far to "only" about 11.5Kya. The Younger Dryas ran from about 12.9-11.7Kya. If Gobekli Tepe was indeed founded that "recently", and its artifacts really do document a comet impact a millennium and a half earlier, we're going to have to upgrade our estimate of the competence of our ancient ancestors who could memorialize such an event for so long. Which the mere existence of a sophisticated "city" like Gobekli Tepe already forces us to do. "The team fed likenesses of the images carved onto the pillar (known as the vulture stone) into a computer to determine if they might be linked with constellations. Doing so revealed associations between characters on the pillar and astronomical symbols in the sky for the year 10,950 BC." Considering they are searching against modern astronomical symbols invented 12,000 years later. This seems like a poorly modernized interpretation of ancient artifacts to me, in the "Ancient Aliens" style. Though, it was published in an open access peer reviewed journal, I think it will be my reading today. ... we're going to have to upgrade our estimate of the competence of our ancient ancestors who could memorialize such an event for so long. Which the mere existence of a sophisticated "city" like Gobekli Tepe already forces us to do. We? The epic of Manas in Kyrgyzstan is a million-line poem that has been passed down orally for over a thousand years. The Hindu vedas are also passed down orally. Writing is considered suspect, like hearsay in court. They use special memorization techniques to prevent corruption of the text. Whereas today, if your phone battery dies you can't find your way across town. I think the ancients were always more competent; the thing to upgrade is the estimate of modern arrogance. Did I say Ancient Aliens style? This was my favorite quote from the paper: "The H-symbols on the belt, according to our interpretation, indicate bright stars or pole stars. In addition, the crescent shapes can be interpreted as phases of the moon, given the astronomical theme. So perhaps the belt indicates these 'beings' are not of this earth, and instead they 'inhabit the sky'? This supports the notion of comets, particularly as comets are easiest to see at night." They may be over-interpreting these pillars, but it is certainly food for thought. AFAIR, there's no convincing mega-impact site. Suggestion that the main whatsit whacked an ice-cap which has since melted back mean geologists must look harder for 'secondary' evidence. In the movie versions, this is also going to have a warning that it is about to happen again ... by the end of the film. I love their conclusions, but I suspect that this research will be butchered by critics. The ghost of Ales Hrdlicka and the Clovis Police still haunt the extinction of the mammoth debate. One mythologist that I've spoken to suggested that there are no known records for either the zodiac or precession that date earlier than 500 BC. Arguments over mythology can be similar to arguments that end up mired in statistics; it becomes a filter which winnows the conversation to a very small slice of the population. Most observers are trying to just figure out who to trust, and that game usually ends up predictably. Notice that the Wikipedia page for "Aquarius (mythology)" supposedly ground zero for astrological interpretation, is illustrated merely by a starless man pouring water into a starless ditch. Obfuscation continues to this day. I wonder by what mechanism can a comet impact create a thousand-year long cold spell. Throwing dust into the air? It wouldn't stay there long enough. Throwing water into the stratosphere? There was an older study around here saying that the stratosphere has a stable layer where water in the form of ice can last longer than expected (but for 1000 years?) Causing some geological events like a volcano eruption? The Deccan volcanic eruptions happened around the end-Cretaceous impact event.